Like early communication in the LGBTQ+ community, queer literature emerged from clandestine networks: books were printed and distributed in secret. Early literature was subject to harsh censorship and heavy-handed editorial control if the content was overtly LGBTQ+. Overcoming homophobic charges of obscenity and immorality, the queer community took control of their narrative, authoring queer pulps and establishing homophile organizations to build community and awareness. 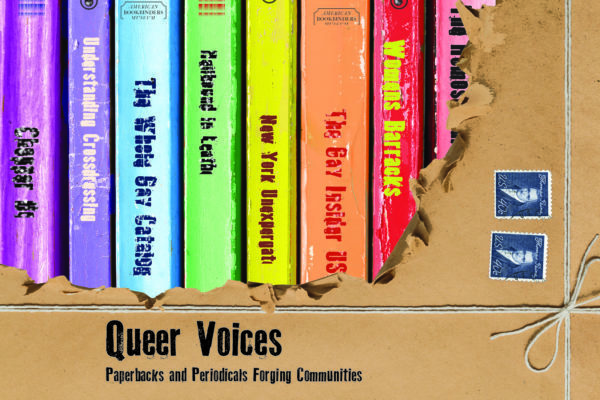 The American Bookbinders Museum, in collaboration with the GLBT Historical Society, is proud to present a retrospective that spans twentieth century queer literature from pre-WWII underground books, lurid mid-century pulps, periodicals from the early homophile press, and the colorful, sometimes angry publications of the gay liberation movement. Come out, flip through the pages of queer literature and be proud. The American Bookbinders Museum is the only museum of its kind in North America, celebrating and exploring the history, tools and stories of bookbinders and bookbinding, from its earliest forms through the changes and innovations of the industrial revolution. In addition to the craft and artistry of binding, we focus on the stories of the men, women, and children who worked in binderies.